North Korea has been in the news a lot lately due to its threats to conduct a nuclear test against the approval of not only the United States but also of Russia and the country’s only ally China. In fact, things are getting so bad that China has even cut off all imports from the country as well as stopping all flights into and out of the capital city Pyongyang. The country is one that most people know little about and much of the world is actually afraid of. In fact, it’s nearly impossible, and can even be considered dangerous to visit there. Those who get around the red tape and are able to enter the country and strict guidelines they must follow in order to avoid being detained, or worse. For instance, photographs are rarely permitted, blue jeans are forbidden, you must be with a tour guide, and it’s not so allowed to talk to the locals. Whether it’s because they don’t want us to know or because it’s so difficult to get the information, North Korea is pretty much a mystery. Lately, however, some rare photos have been emerging that give us a peak into the lifestyle over there. Here is a look as to what is really happening in the country behind the curtain. 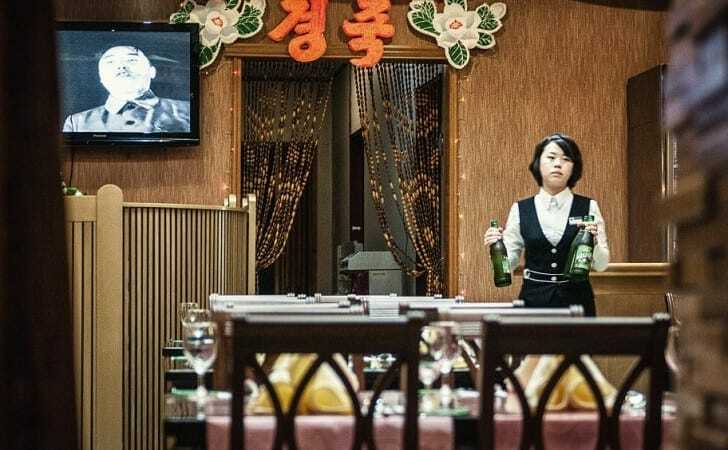 Despite regime propaganda portraying its people as being generally smiling, happy and well-fed, several of these pictures seem to show that the actual lives of North Koreans is anything but positive. Using a hidden camera, this photographer snapped a picture of some random people on their way to work. The results are show a different, much less sanitized version of the totalitarian country. Due to a famine hitting the country because of international trade sanctions, North Koreans live off of food rations from the government. The government claims that they provide their citizens with all that they need but in reality, as this photo which was secretly taken of a grocery store proves, this is not necessarily the case. 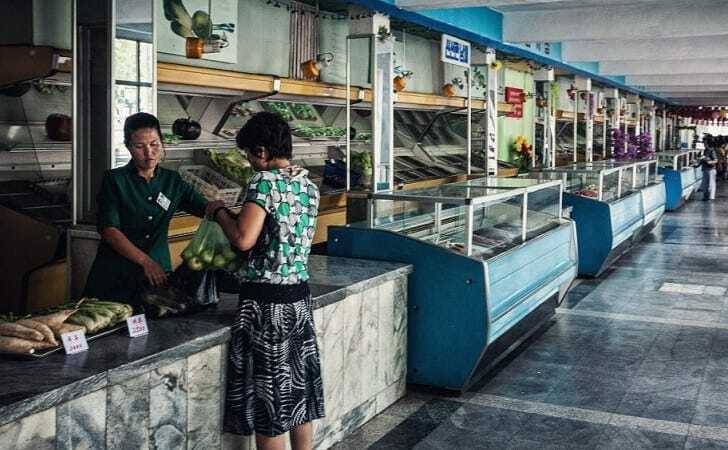 This Pyongyang supermarket is for the above average (although not elite) North Korean, and shows the paltry offerings on hand, mainly apples, turnips, and leeks. Known as the Hermit Kingdom for being so isolated and closed off, this pariah state is notorious for keeping the lives of its citizens and military a closely guarded secret. While they are known for performing illegal nuclear tests, concentration camps, and having a fierce military, not all is as it seems. 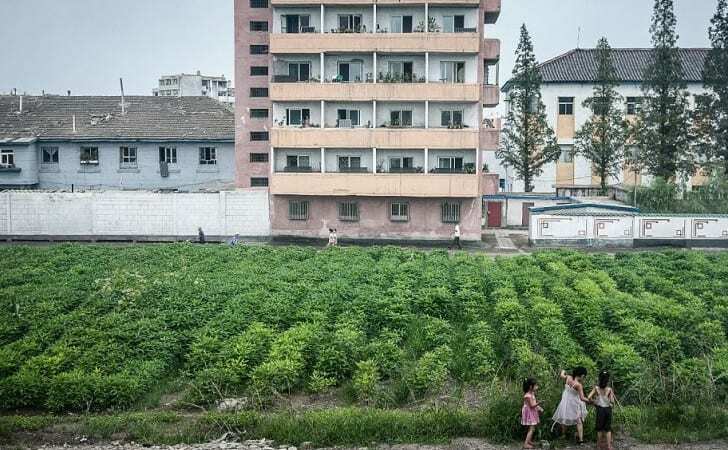 A daring photographer on a recent trip to the country took photos of everyday life in North Korea, an act which could have cost him his life or gotten him charged as a spy and sent to a concentration camp. Most of the country of North Korea is starving, with a huge percentage of the population dangerously malnourished, eating rats and squirrels for sustenance. 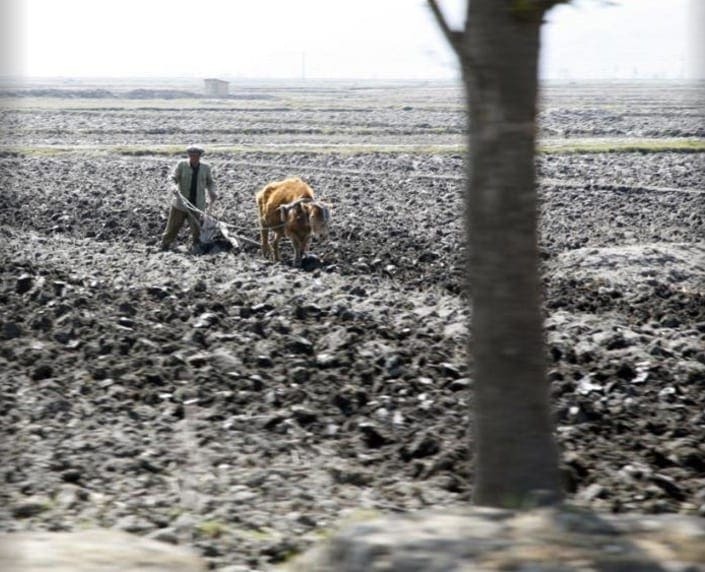 The country is therefore trying to increase its arable farmland in order to feed its people. However, due to still using farming methods from the 1700s, this isn’t really working out, with people all over the country emaciated and malnourished. 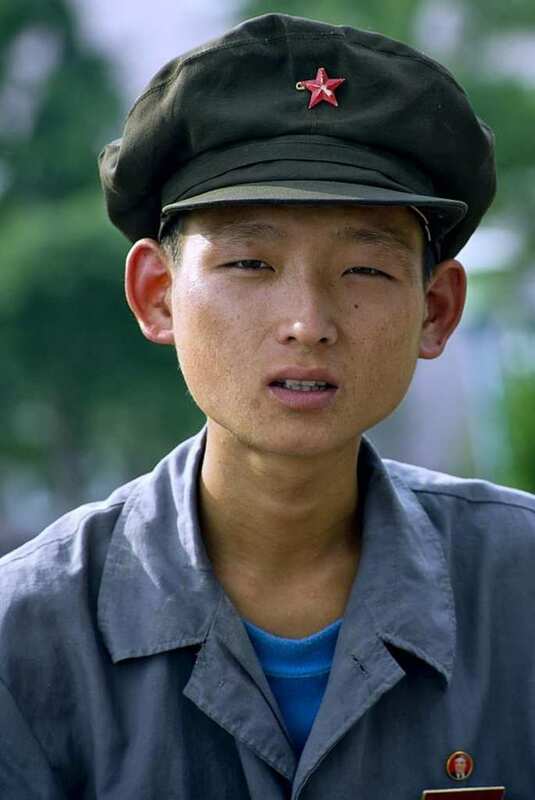 North Koreans who escape to China are easily recognizable for being extremely thin, and for their tendencies to eat everything they see. When foreigners come to visit the Hermit Kingdom, they are taken on tightly controlled, heavily monitored tours where photographing the wrong thing may just put you in jail, or worse. 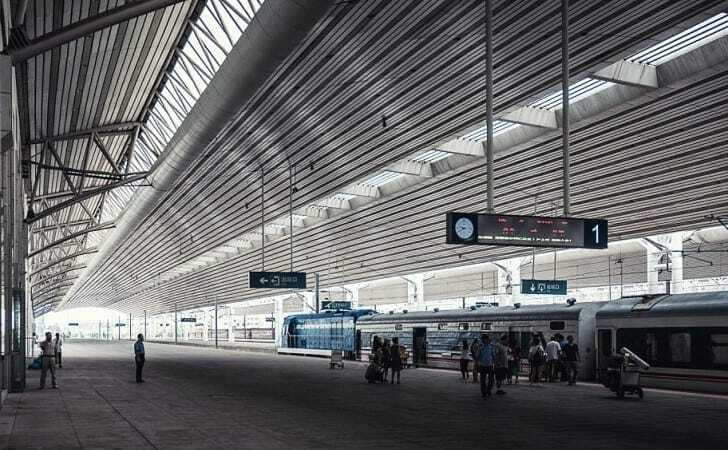 This photographer risked his life by taking a photo of a nearly empty train station. 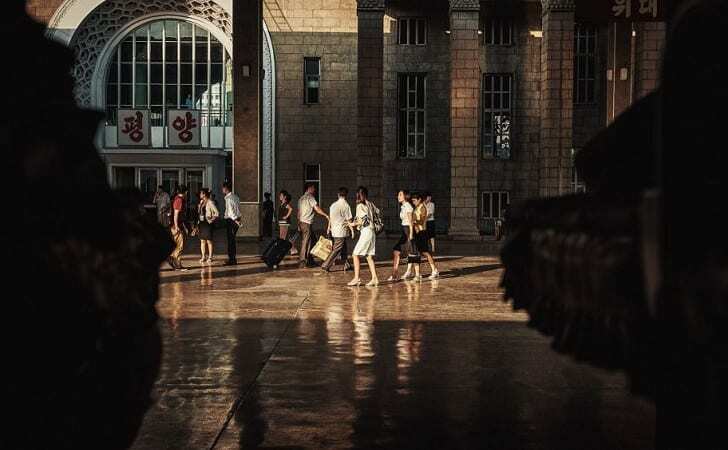 North Korean citizens are closely watched, and they are not allowed to travel outside of their own town or village without express written permission from the regime. The train here is mainly for tourists, and just another cog in the regime’s propaganda machine. 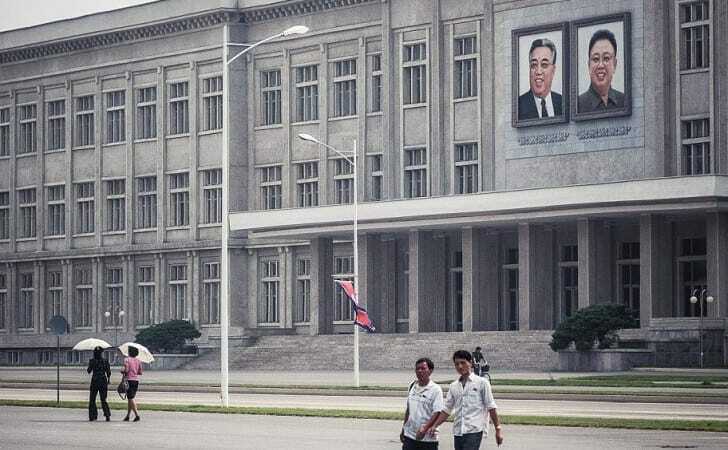 The primary architectural style in North Korea in general and Pyongyang in particular is the old Soviet style uniform cement gray. Technically a communist country, the regime says that everyone is equal, and therefore the buildings should be equal as well. However, due to international sanctions and low technical abilities, many of these buildings are not structurally sound, and many more simply lie empty. There are a surprising amount of taxi cabs in North Korea, but they all seem to be centered in the capital city, Pyongyang. 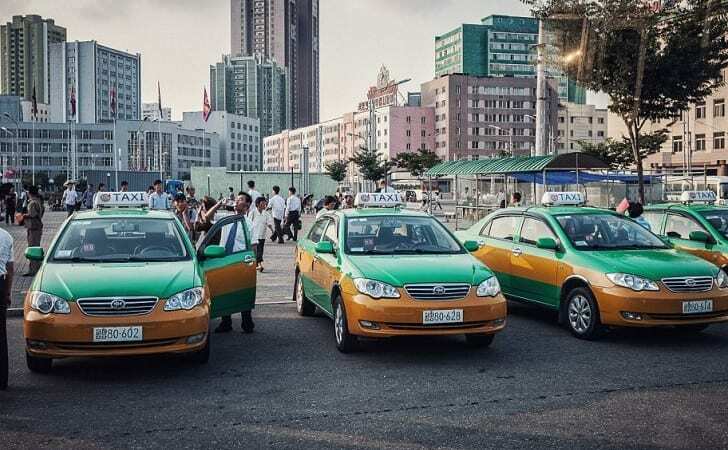 Despite the harsh poverty in the country, North Korea’s elite – many of whom are multi-millionaires – are probably the ones keeping all of these cabs (all of which is state run) in business. Chances are high that if you tried to order an Uber in Pyongyang, you wouldn’t be able to find any! 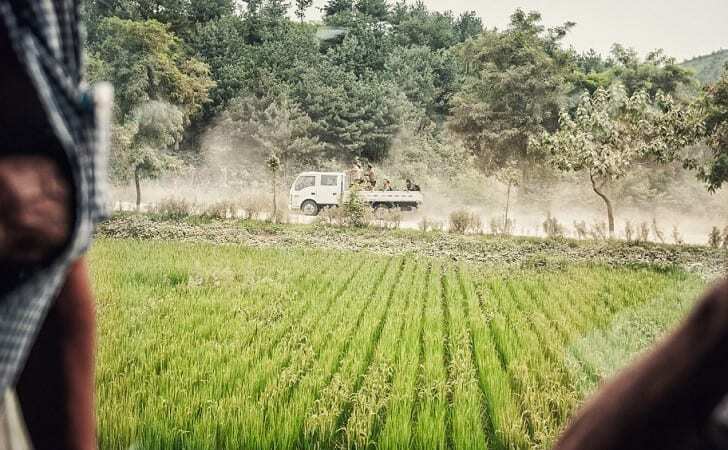 This photo from a train shows some of rural North Korea with what appears to be a small rice paddy in the foreground, and a truck carrying people as it drives along the road. However, upon closer inspection one can see that those people in the back of that beat up looking truck from circa 1986 are actually soldiers! For a country which claims to be so strong and so modern, it seems a bit suspicious that their soldiers need to be transported in the back of an old pickup truck! North Korea has miles upon miles of beautiful beaches and coastlines, as can be seen in this picture. However, upon closer inspection, one can see that all along this coastal road is a fence. Not just any fence, but a fully electrified fence. This is a country which can’t afford to give all of its citizens electricity, but has an electrified fence surrounding the country in order to make sure its citizens never leave. A country as big as North Korea needs roads so that people and goods can move from one place to another. However, private car ownership is so low that there is almost never any traffic to speak of! 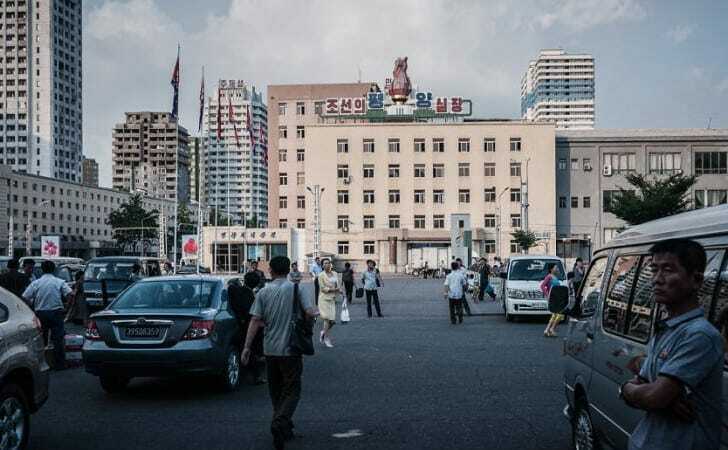 In fact, in most of Pyongyang or other cities in the country, it is normal to see people walking on wide boulevards meant for car traffic because they know that there will never be any cars coming down the street. 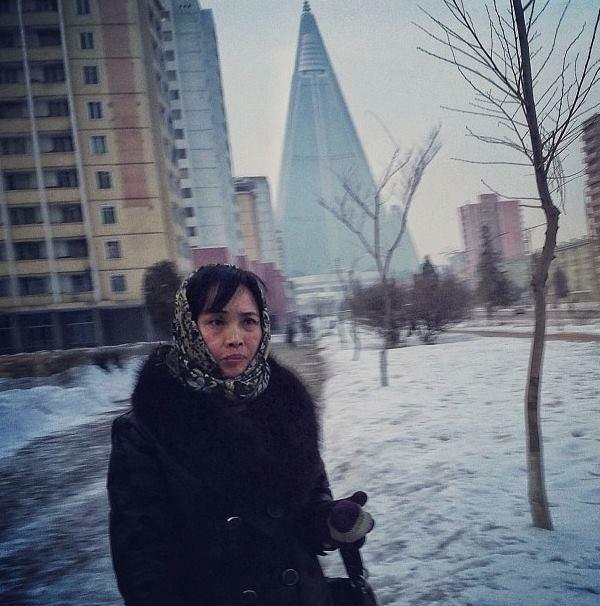 Downtown Pyongyang is a place that the North Korean tour guides love to show off. There are tons of modern looking, flashy buildings which wouldn’t look out of place in countries such as China, Japan, or even Europe! However, these buildings are sadly mainly just a sham – most of them are empty or incomplete on the inside, and those that are complete don’t have electricity! Can you imagine having to walk up to the top of one of those towers? 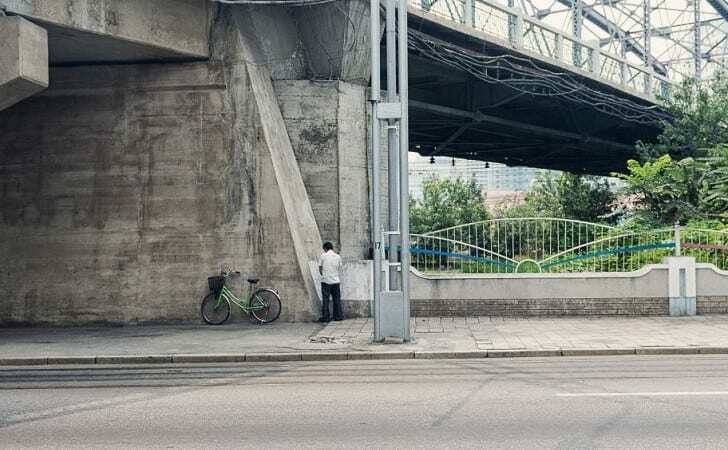 Sometimes when you gotta go you gotta go, as this guy is doing in this hidden camera picture. However, in a country where everything (and we mean EVERYTHING) is controlled by the government, this guy is taking quite a risk. In the United States, should a cop see someone relieving themselves on the side of the road, the person in question will probably receive a ticket. In North Korea, this man would likely be sent to a concentration camp. Just like in a chapter of 1984, everyone’s movements and words are monitored by the government. 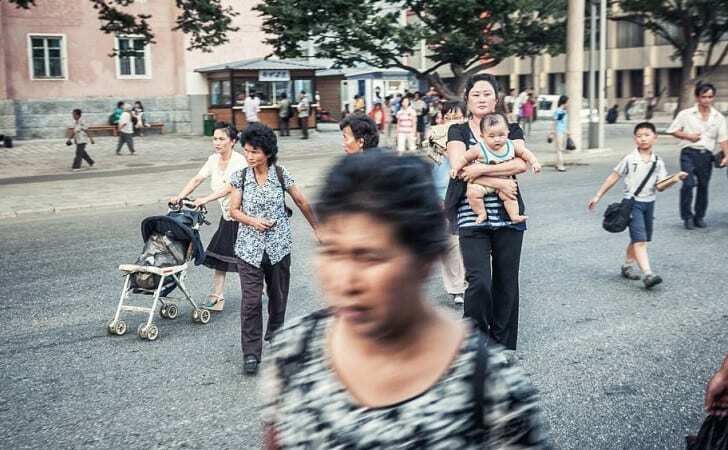 There isn’t a place in North Korea where you aren’t being watched, with hidden cameras and microphones located everywhere from homes to offices, parks and squares to even busses and cars! 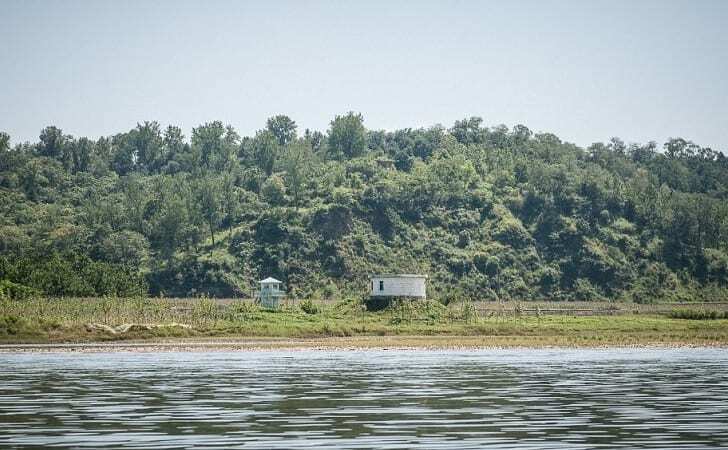 It is a not uncommon sight to see North Korean military watchtowers watching towns, making sure that everyone is in line. This shot of the Central Government Building is interesting for a whole number of reasons. First of all, it shows government bureaucrats walking around in their average day to day lives. Secondly, it shows no cars on the roads, and people just walking about knowing full well that they will not be hit by a car. Thirdly, it shows that this photographer was extraordinarily brave, as taking a picture of this building can get you arrested on grounds of espionage, and executed. 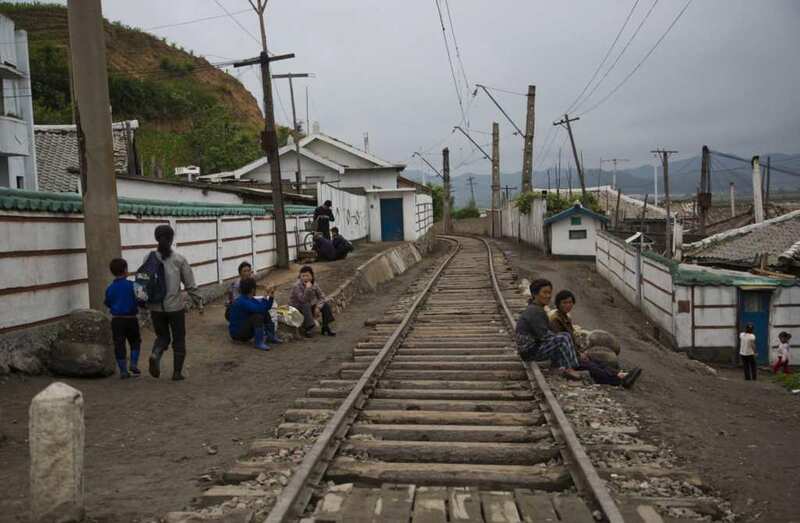 As you can see, this is what constitutes a railroad stop in rural North Korea – a literal hole in a wall and a dirt path leading to the railroad tracks. 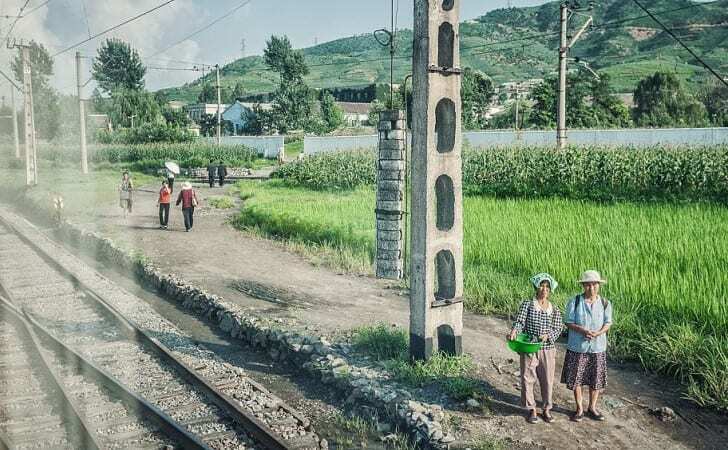 Due to the fact that it is nearly impossible to get a permit to travel outside of their own home villages, it makes sense that there isn’t much real infrastructure for traveling outside of the North Korean capital Pyongyang. Imagine watching the president speak all day every day in between patriotic country music videos as well as propagandist history shows. And not only that this is all that is on TV, but you are, by law, REQUIRED to keep these on in your home or business if you have a television or radio. If you don’t keep your television or radio on in order to at least listen to the propaganda you can be put in jail, or worse. There are tons of cities and towns all across North Korea. The problem is, not all of these towns and cities are populated – at least not all of the time. In order to make a city look prosperous and alive, especially to foreign satellites and spy planes, the Hermit Kingdom’s regime will periodically call on the entire population of a town to uproot and move to a different town, thus making it seem to observes looking at North Korea from afar that all is well in the pariah state. 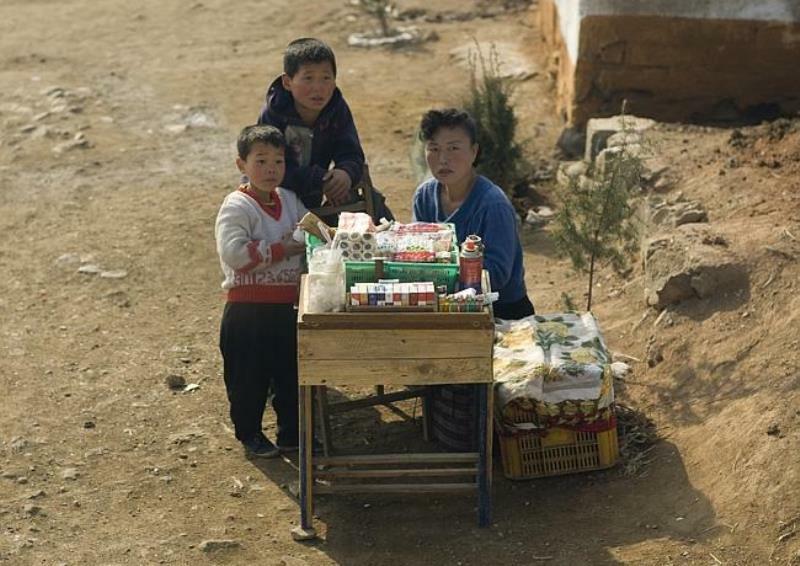 For those North Koreans too poor to go to a grocery store – IE 90% of them – many have resorted to eating what they can find on the ground, including scraps, rats, birds, and even grass and leaves. In fact, the North Korean government has actually put out a cookbook on what types of grasses and leaves taste the best, and how eating all of those greens all the time isn’t so bad after all! Although to be honest, if you’re eating grass, things have probably gotten pretty bad. In order to keep their population in line, the North Korean government simply has military everywhere, including every city and farm. 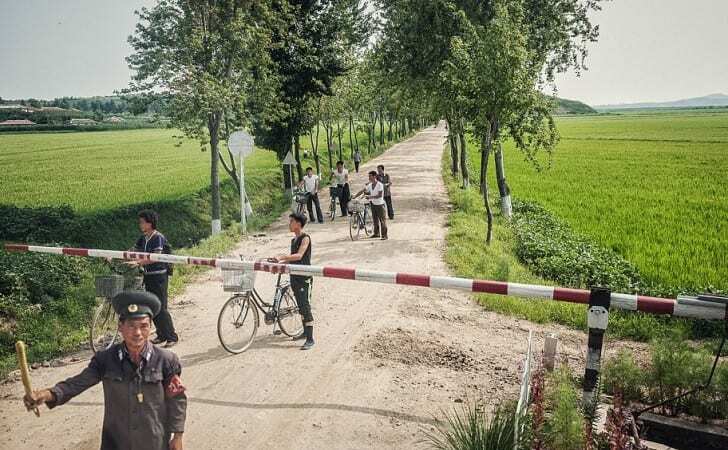 That includes this soldier, who’s only job in life is to tell people in this tiny little North Korean farming village when a train is coming and blocking them from getting on the tracks. Imagine, a soldier to guard a track for a train to run on once a day! One of the craziest things about North Korea is that their religion is actually their leaders. In fact, the actual leader of the country is a man named Kim Il Sung, a man who died almost 25 years ago! Their prophets are Kim Jong Il and Kim Jong Un, the son and grandson of the “dear leader” Kim Il Sung. 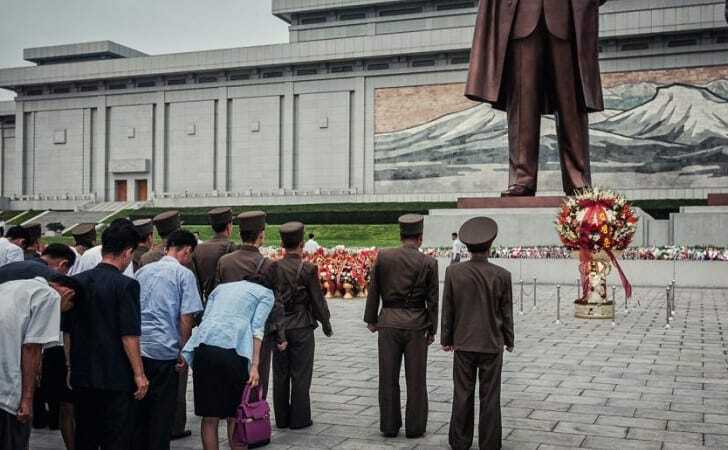 That’s why these people are bowing to these giant statues – they are actually praying to them! One of the only ways to ensure that you and your family will have enough food or even have the most remote chance of a decent life is by going into the conscript military. Although it requires a huge amount of connections, if you can get lucky and pull the right strings, you just might be able to become an officer and guarantee that you and your family won’t be eating grass. This is a rare picture, as the officers are a secretive class. They keep a watchful eye out on every single street corner, making sure that the people are doing what they are supposed to be doing, and reporting the activities of anyone and everyone directly to the state authorities. As can be seen in this photograph taken from a hidden camera, this soldier is meant to be guarding these women whose only job is to sweep dust and dirt off of this street with, you guessed it, no cars! 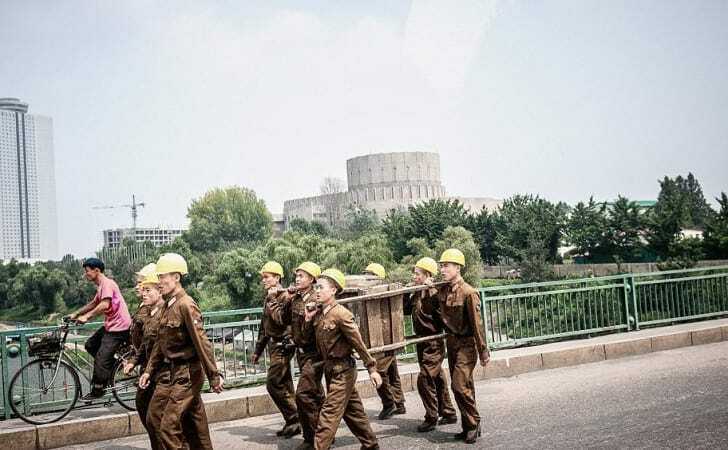 This is a group of North Korean construction workers heading to their work site in Pyongyang. 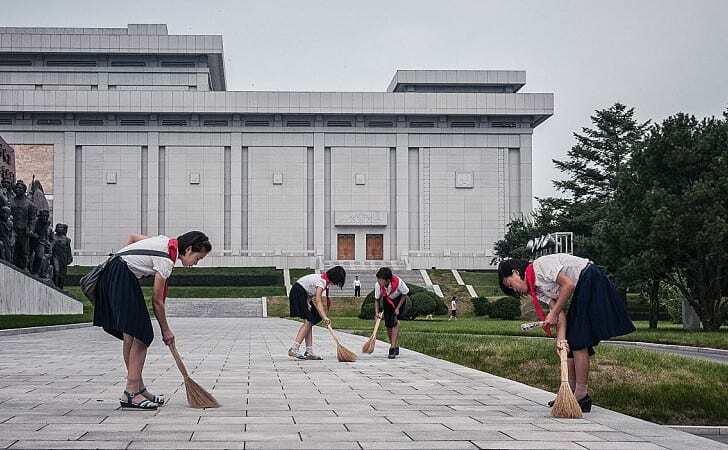 The North Korean regime loves to point out how modern the country is becoming without outside help, and loves to show visitors the huge leaps forward in construction of the country. 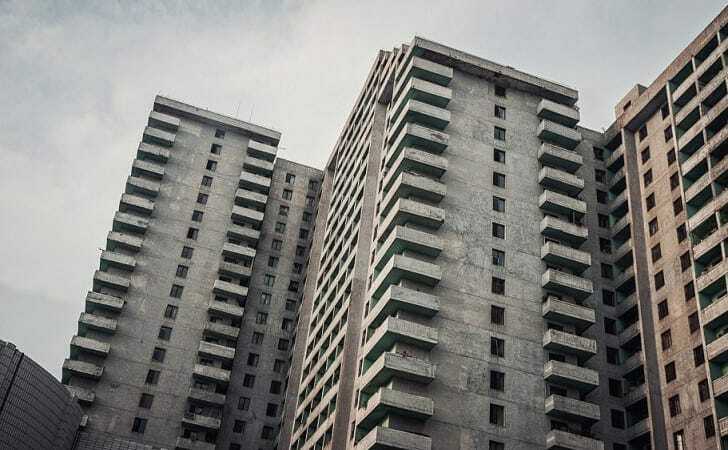 However, due to a combination of lack of skilled architects, shoddy craftsmanship, and the fact that most of these guys have probably only eaten grass for a week, the buildings in North Korea aren’t exactly fit for human habitation. Most cities have guided tours, but the tour guides are happy to let you wander and explain what you are seeing as you go along. But in North Korea, the tours are all organized by the state. The people you are allowed to speak to are vetted by the state. And if you go wandering and your tour guide loses you, congratulations! Now you have a new cellmate because you wandered off (jail sentence) and your guide lost you (jail sentence)! This is a government sanctioned photo taken by a tourist in a train station in Pyongyang, North Korea. However, the funniest part of the photo is, despite it looking like a normal train station with busy travelers milling about, the fact is that these are all actors. Because the trains are primarily to shuttle tourists around, the train station closes very early. By the time this picture was taken (which shows people walking into the train station), the trains had actually stopped running! This bus in the country side which is clearly a relic from the 1960s (it doesn’t look like there is even air conditioning!) is a rare sight. 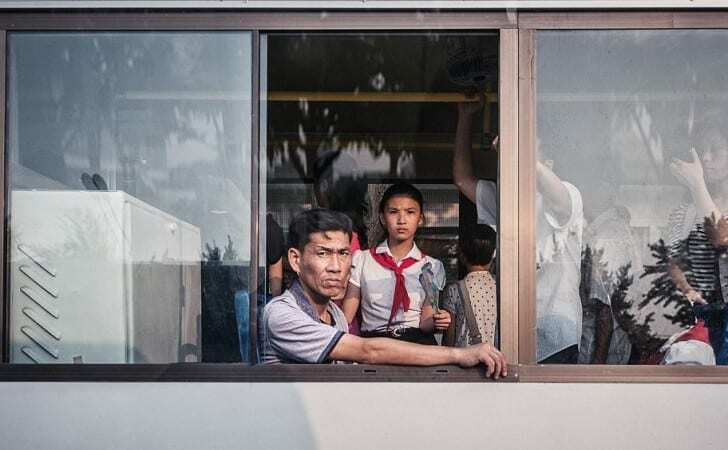 The average North Korean will probably never leave their village, as the entrances to many cities and towns are tightly controlled by the military. If someone does receive permission to get out, then they are likely to be arrested on trumped-up charges of espionage. What a country it must be to have a 0% unemployment rate and jobs for everyone! That must mean they have a great economy! Such a great economy, that even schoolgirls will take straw brooms to brush the dust off the street. Of course, this isn’t exactly the case, but when unofficial figures are impossible to come by, then there is no choice but to take the government’s unemployment numbers to heart. Ok, maybe with the largest grain of salt ever. This photo is perhaps the greatest way to compare how poor and backwards North Korea is as it relates to the rest of the world. 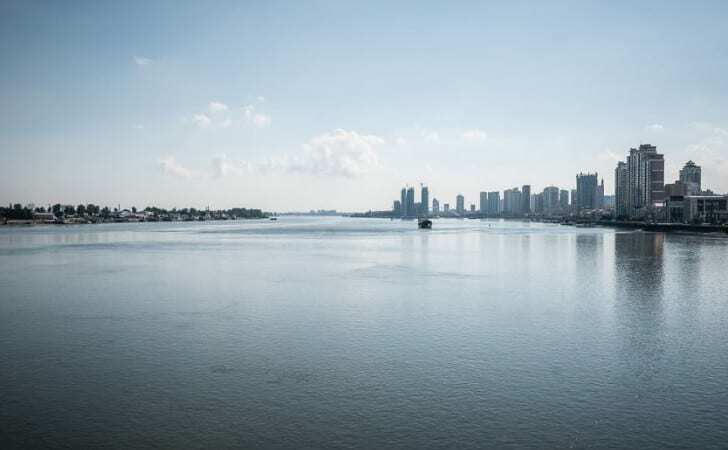 On the right hand side of the photograph is the Chinese town of Tumen, situated on the Tumen river. On the left is a North Korean river village. Many North Koreans try to cross the river when it freezes solid in the winter, and the military will run after them into China to capture them and bring them back. The North Koreans even kidnap random people for ransom! This is a picture taken in secret from a bus passing what appears to be a man behind a steer trying to plow the soil. However, by the looks of the soil from the photo, it seems as if the ground is full of rocks, exactly what you DON’T want when planting crops! 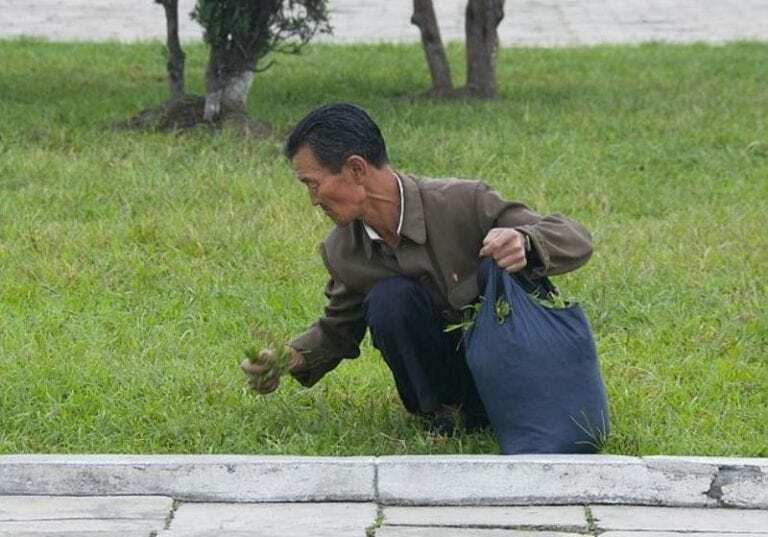 Hopefully this poor man will be able to plant something to sustain his family. Or maybe the North Korean government has a recipe for eating boulders? 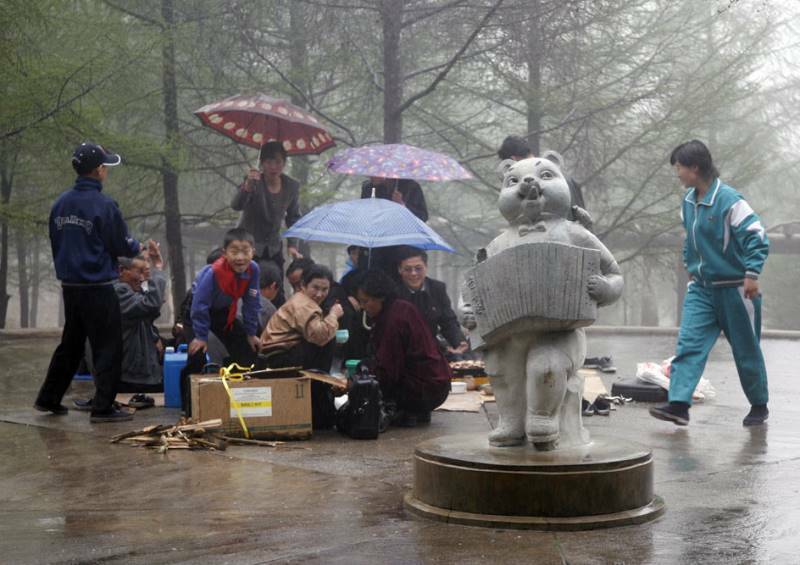 This picture, illegally taken in the North Korean countryside and smuggled out on a USB drive when the photographer left the country. The picture shows children, some seemingly as young as six years old, helping to work the communal farm fields. According to the man’s government tour guide, this typically happens during harvest season when there is a severe economic downturn, a downturn the guide says is caused by America. 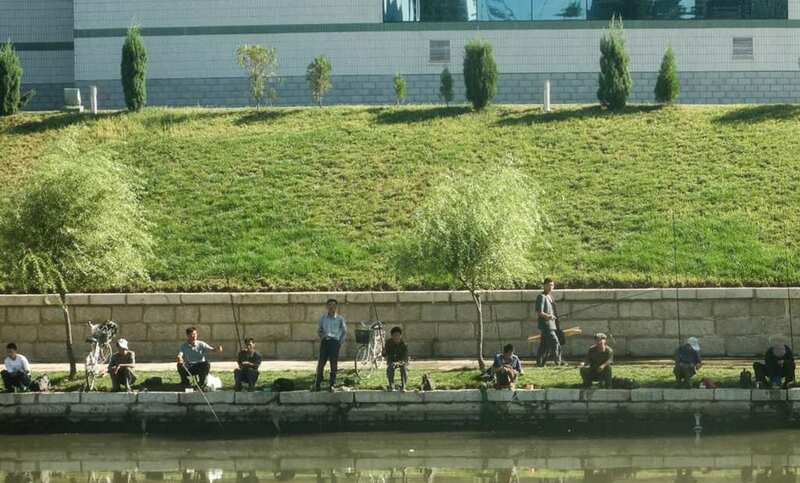 These men are all fishing for their dinners on the banks of the Taedong river. No, this isn’t a scene from some poor, remote village – this is a scene from the North Korean Capital Pyongyang. There is sever malnutrition throughout the whole country, and because fresh fish and meat are nearly impossible to come by in grocery stores, these men must fish in the city’s river to get the protein that they and their families need. 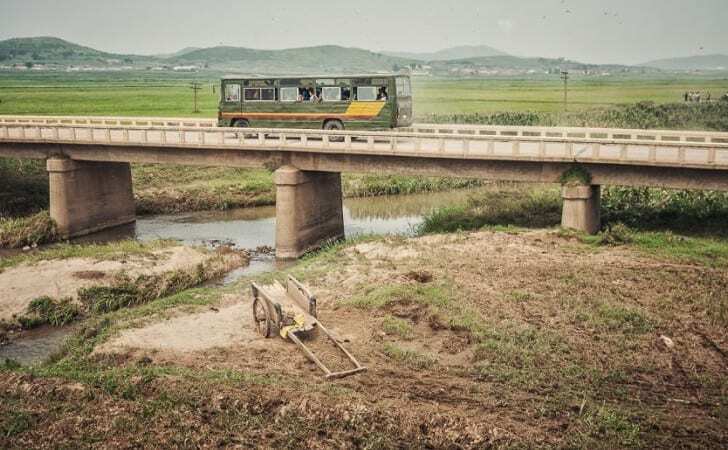 Because running water is so scarce across much of North Korea (even if you have a faucet, there is a slim chance that there is any water being pumped through any of the pipes), the way that most people bathe is by going into the rivers with soap and letting the flowing water take their dirt away. 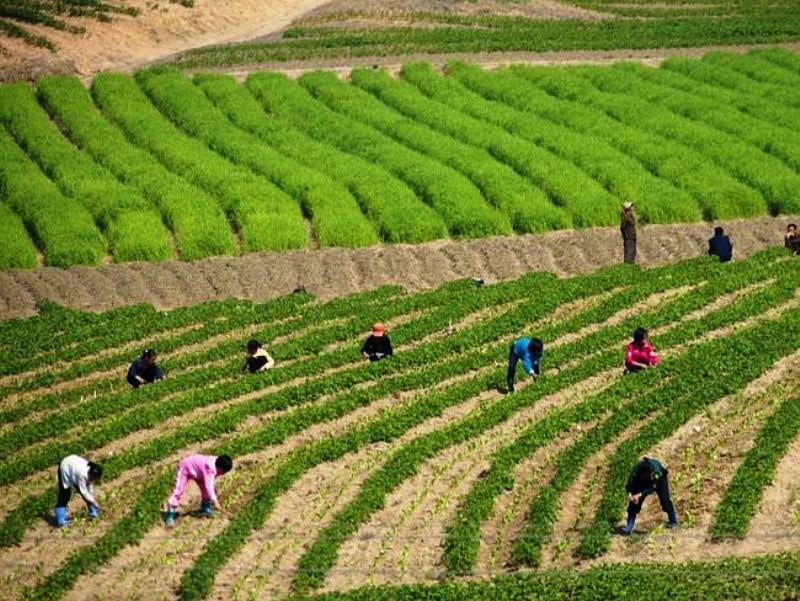 Pictures like this are prohibited by the North Korean government because the censors say that it portrays the country as a poor, depressed backwater. To show off how modern their lives are, the North Korean government has their tour guides take visitors to an “average” North Korean family to show off the fact that they can afford computers and are connected to a special, North Korea only intranet! 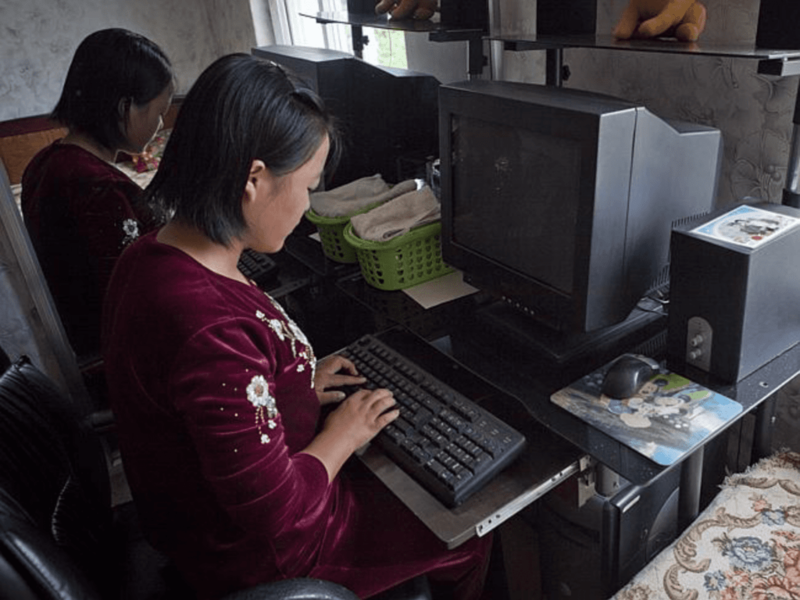 Although the screen didn’t work because there was no electricity when this photo was taken, the actress, er North Korean citizen, was still typing on the keyboard. 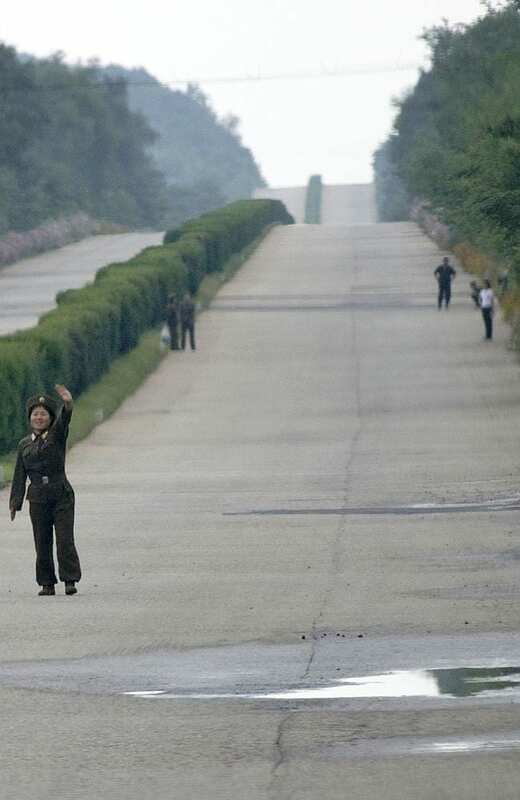 Because so few North Koreans have cars, most of them walk or bike up to four hours each way every day in order to get to their place of employment. Even a professional bicyclist like Lance Armstrong needed “help” to be able to ride for that amount of time! 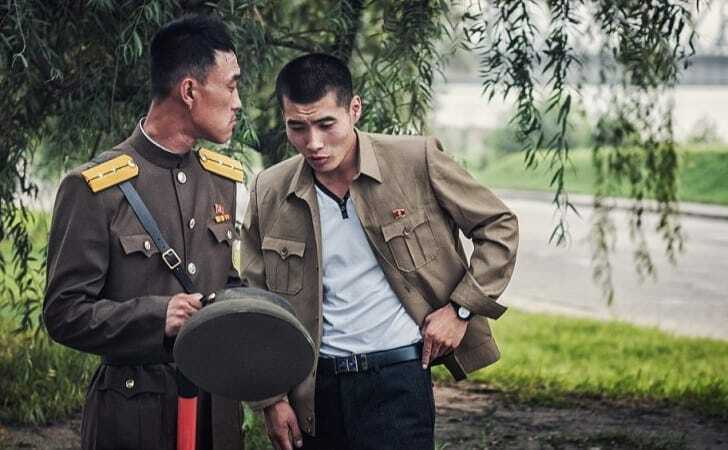 But when the photographer snapped this picture, he allegedly got yelled at by his minder, saying that it is a crime to show people being tired in North Korea. Millions of children across North Korea are malnourished, with tens of thousands suffering from stunted growth and severe malnutrition. 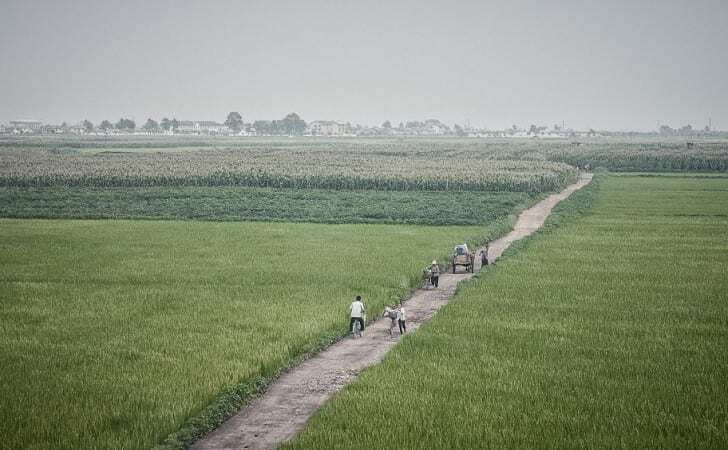 This is partly because approximately a fifth of the food production in the country has failed, leaving many in the rural areas – especially children – without enough to eat. Meanwhile, the leadership in Pyongyang which is wealthy and close to the regime is plump and happy. This picture is illegal as it goes against North Korean government claims of there being no underfed children in the country. 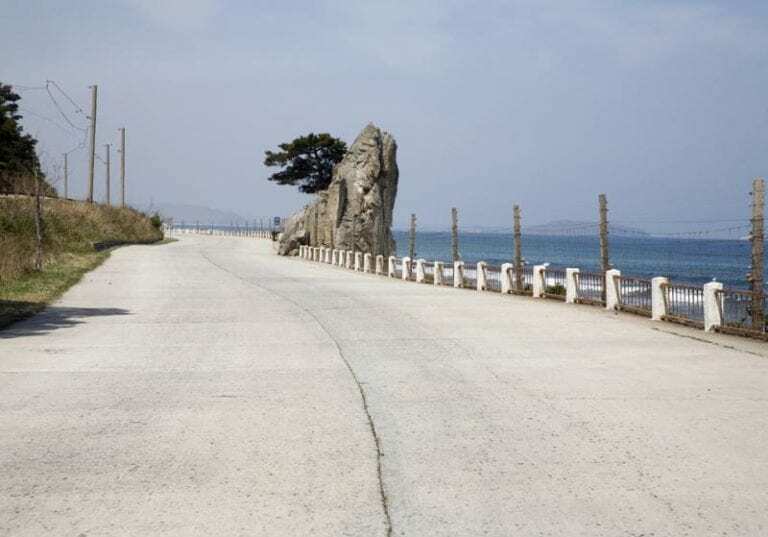 Due to there being almost no cars in North Korea, people usually walk and ride bikes everywhere. But when cars do come along, many people hitchhike, and the ones who get first dibs on rides are, of course, the soldiers. But why can’t they just take a bus? Because there is no public transportation between towns, and the only way to leave town is by receiving express written permission from the government to travel. This picture is of a group of people walking on a highway between towns. Farming is a national activity which requires everyone to become involved in some way shape or form. New recruits and those of the lower ranks, when they aren’t practicing how to shoot at targets or learning North Korean military doctrine, they need to find a way to make a living and make money. 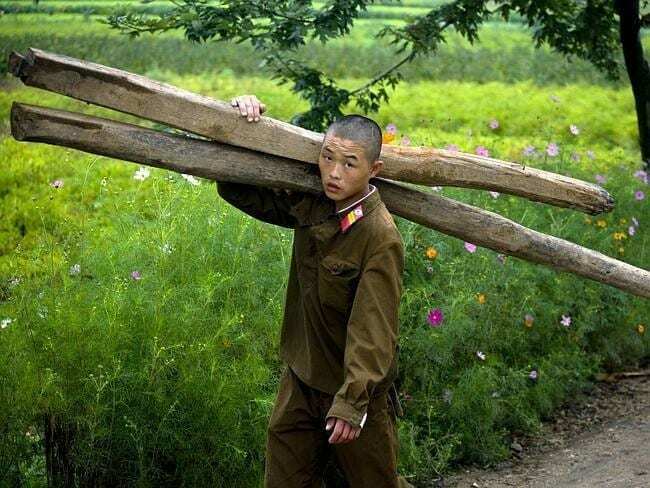 Many conscripts, like this young soldier here, work on farms in exchange for food and money, as the North Korean government doesn’t have the means to pay all of its soldiers. 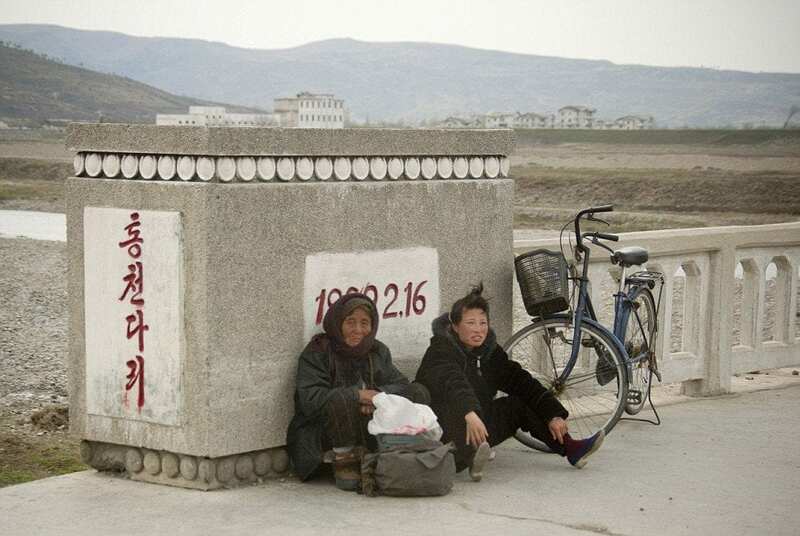 The photographer was taken to the North Korean border town of Kaesong, located right on the border with South Korea. 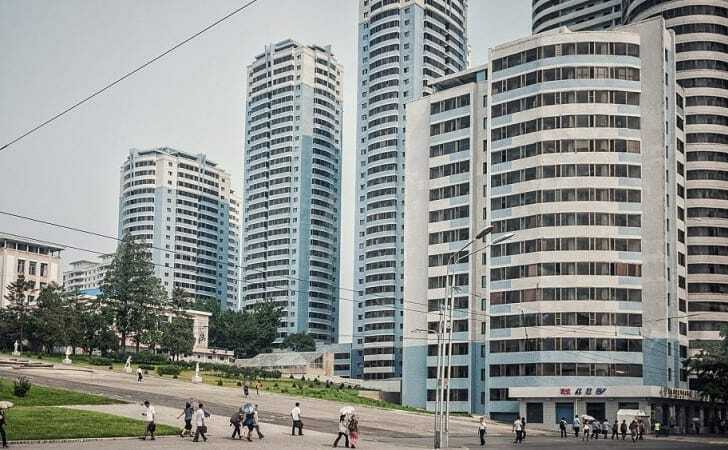 Although the guides told him that the relatively nice area the hotel was in was how the rest of the city looked, the photographer managed to snag a few shots of the crippling poverty which exemplifies all of the areas of North Korea which lie outside of the capital city Pyongyang. 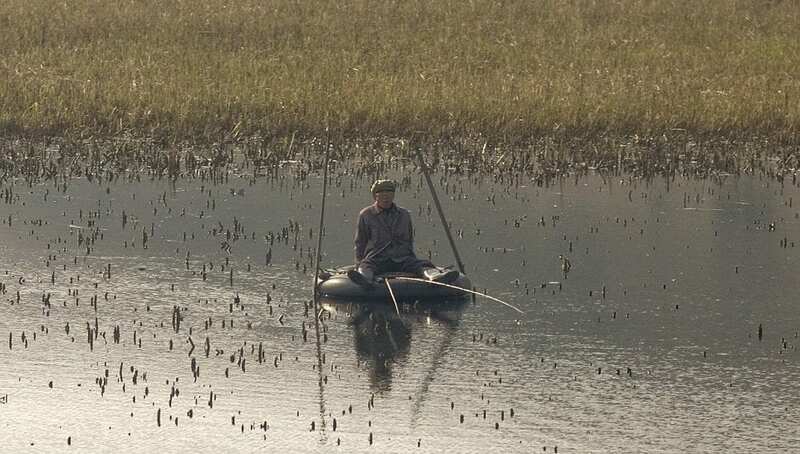 Just like on the banks of the Taedong river, this man in a rural area of North Korea is trying to catch fish for his family’s meal, as he surely won’t get any rationed out to him by the regime. 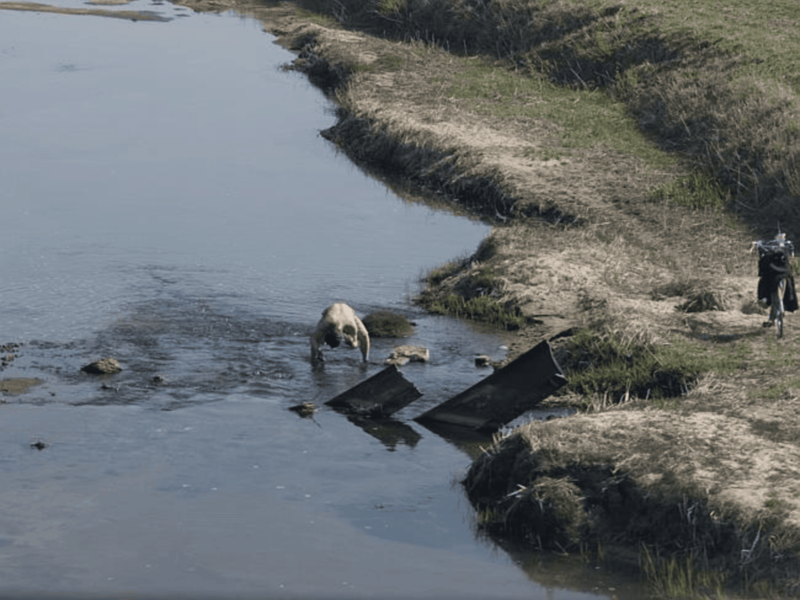 He is so desperate to get some bit of protein that he has upped his chances of catching fish by taking an old tractor tire and, using is as a boat, rowed himself out into the middle of a small pond. Hopefully he was able to catch something that day. 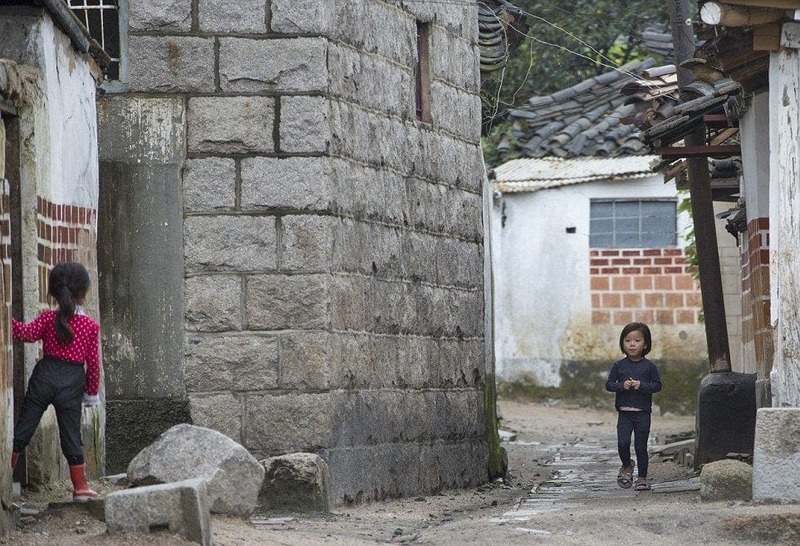 The North Korean regime is very sensitive about showing how poor and starving their people are, trying to preserve a facade of success and happiness and strength to the outside world. 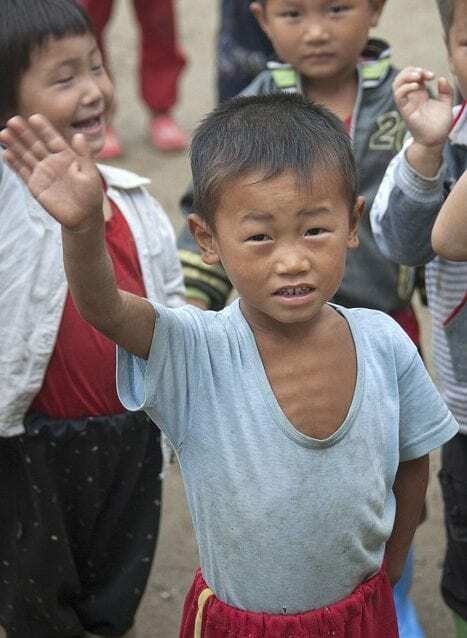 However, the photographer was able to snap this picture of a rural North Korean laborer who shows clear signs of malnutrition and iron deficiency brought about by not enough food. The photographer could have been put in a concentration camp for this picture. 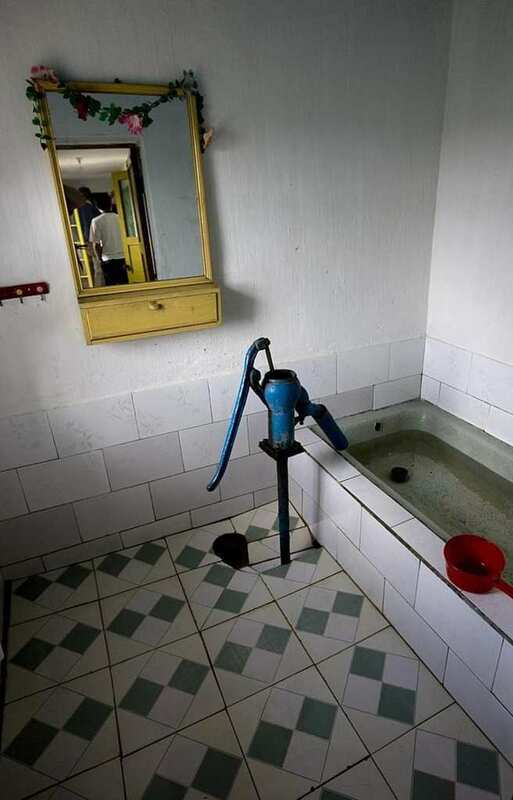 This photo shows the inside of a North Korean home, specifically the bathroom. Taken after having evaded his government minder for a minute, the picture shows the plumbing in the house – or rather, the lack thereof. The picture clearly shows a hand pump used to pump underground well water, but the water is going into a bath. This water isn’t for bathing however – it is for drinking, with the bathtub being used as a water storage tank! 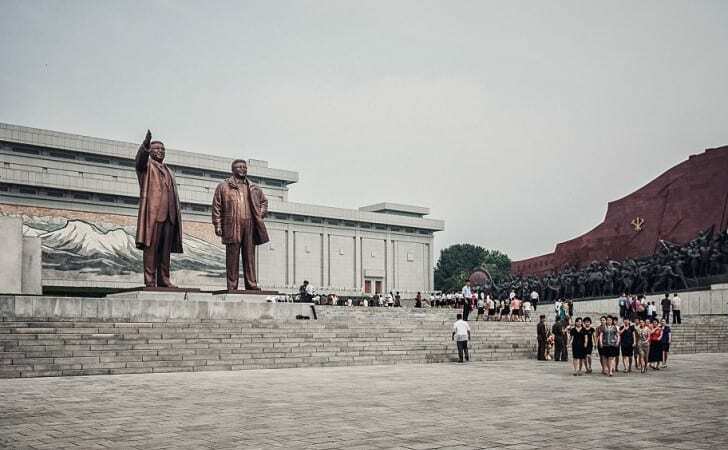 North Korea maintains that it is a regular country just like all the rest, except that it is a perfect communist state with no crime, fully healthy people, and no poverty whatsoever. However, just one look outside of Pyongyang will show you that the entire country is mired in poverty, like this rural village. 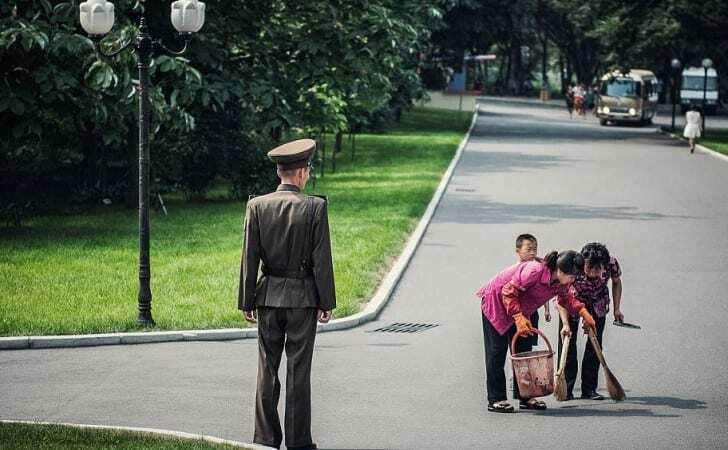 This photograph was smuggled out of North Korea by the photographer who risked his life bringing these images to the outside world. 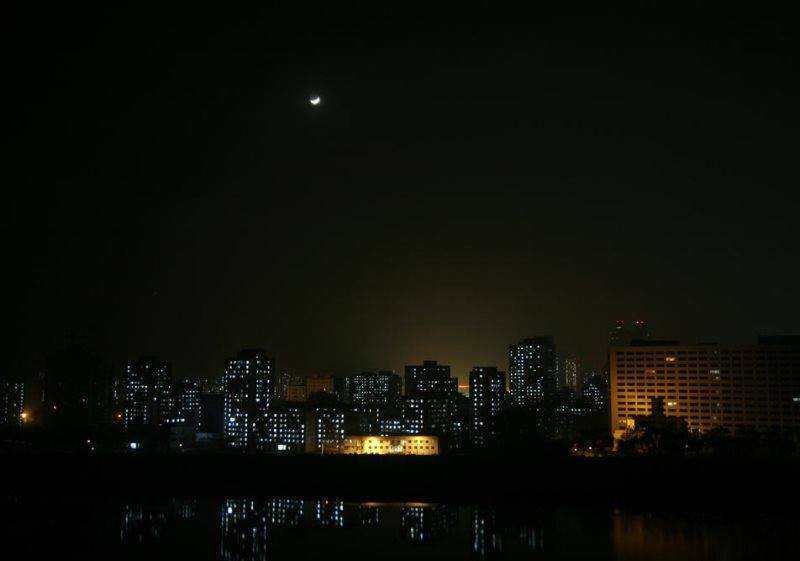 Just like in the rest of North Korea, blackouts are an all too common occurrence in the capital Pyongyang. In this photo one can see that there are no lights on in any of the buildings, as there is simply no electrical current in the city at this time. The only thing with light is a picture of the Dear Leader of North Korea. 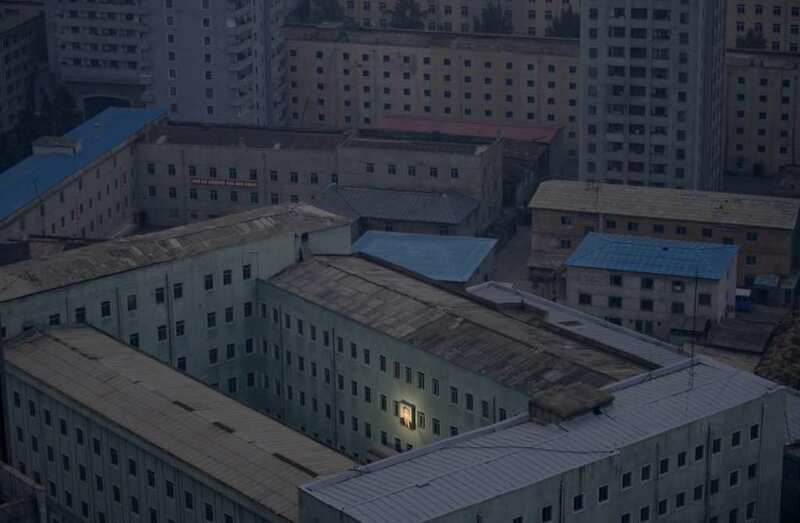 While a North Korean may show that this proves he is divine, other skeptics may argue that it’s just an industrious citizen who was able to get their hands on an electric generator. 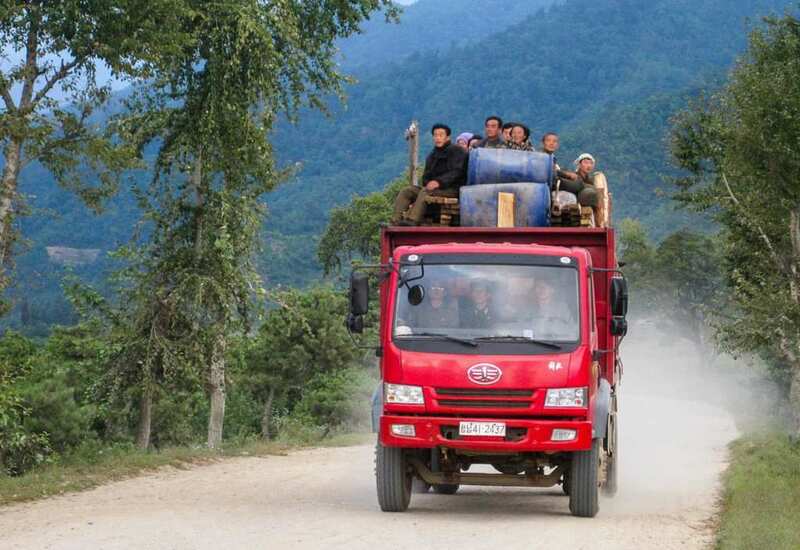 Due to the lack of public transportation, North Koreans are forced to hitchhike if they want to get around under the radar. There are many drivers who have their own personal vehicles (or company trucks as in this picture) who make extra money on the side by charging people for rides. Any form of private enterprise is considered illegal in the Hermit Kingdom, which makes what these drivers are doing very risky. Despite being billed as a worker’s paradise, most of the country does not have access to electricity, with rolling blackouts across the country a common occurrence. Especially now that China is refusing to import North Korean coal, the Hermit Kingdom is having a lot of difficulty keeping the lights on. Look at a light map of the world, and you will see a giant dark spot where North Korea should be. Just like everything else in this quasi fascist state, even intra-city public transportation is in short supply. 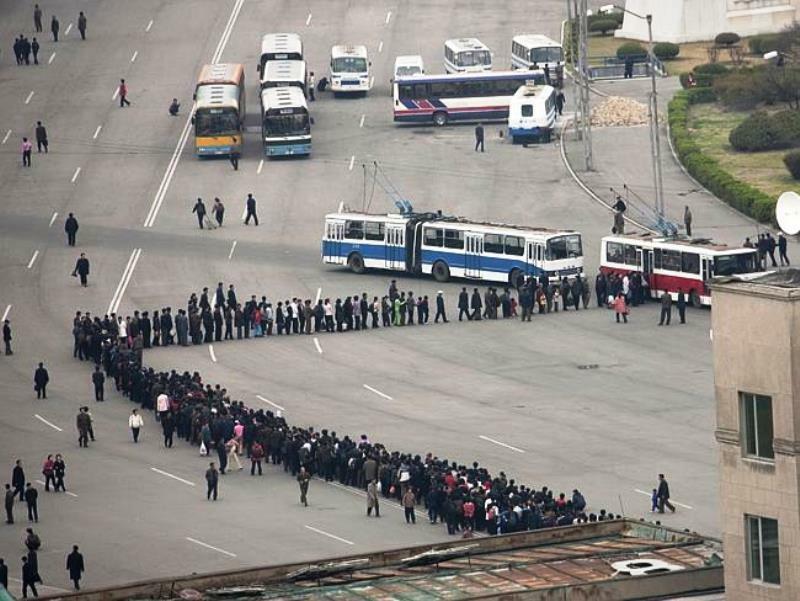 There is only public transportation in the capital Pyongyang, and the busses which come are few and far between. That is why scenes like this happen, whereby people wait in huge lines, sometimes for hours, just to get to work and back. And you thought that your daily commute was bad. We’ll take our traffic jams. Most of the jobs in North Korea are divided by gender, just like how the United States and most of the world was back in the 1950s. It seems as if the entire country is in a 1950s time warp, where nothing has progressed. If anything, the entire society has regressed back to the feudal ages. 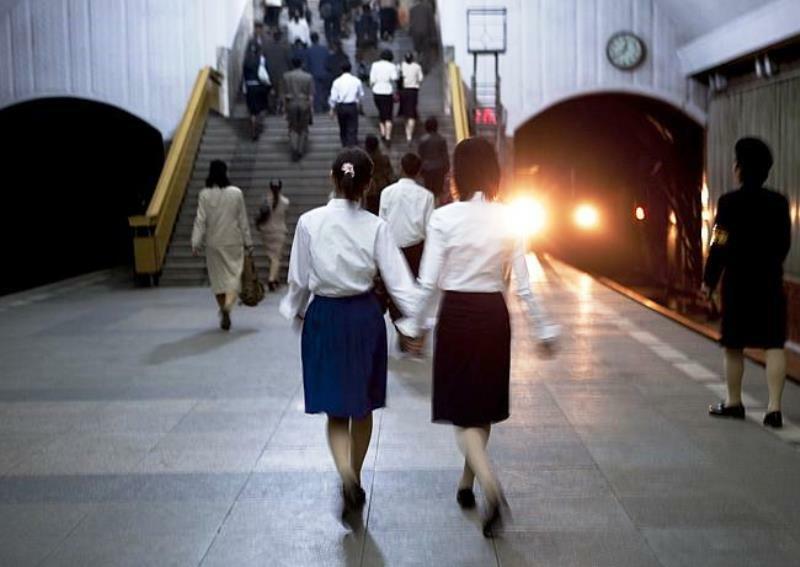 These women are probably best friends who work together, and in North Korean society, it is not unusual to see grown men or grown women holding each others’ hands. Not too long ago (think 2012), it was extremely rare for foreigners to be granted access to the Hermit Kingdom. In fact, the only way to get into North Korea was to stay at a North Korean run hotel in China, give your passport to the North Korean embassy there (with a nice bribe inside of course), and wait. The process is now a lot simpler, and they are more used to tourists. This picture was taken before tourists were a normal sight. This gigantic building in the middle of Pyongyang is meant to be a hotel. Standing at 105 stories, it is indeed a giant and testament to North Korean engineering. Construction began in 1987, but was halted in 1992 due to lack of funds because of the fall of the Soviet Union. The building stood uncompleted until about 2011 when the exterior was finished. The interior still isn’t done though, and the building has yet to open. 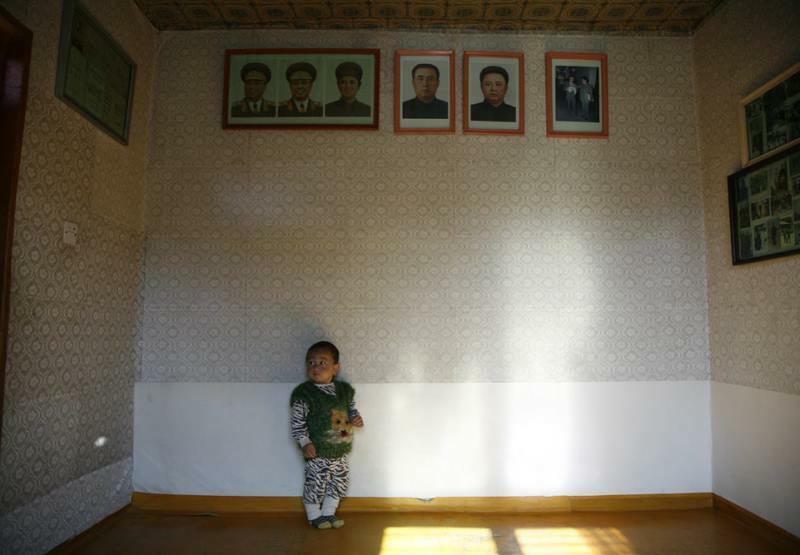 Inside every home in North Korea are pictures of the three leaders of the country: Kim Il Sung, Kim Jong Il, and Kim Jong Un. Every family must have these pictures prominently displayed in their homes, and people will essentially pray to them due to the Kim’s cult of personality. In fact, there is a famous story of a little girl who died trying to save the pictures of the Kims from a flood, and she is now venerated as a hero. These giant blocks on this road are not meant for decoration. They are meant to be blown up in order to create tank traps in case of an invasion (primarily by the United States). As these blocks fall they block the road so nothing can pass. Additionally, one can see that there are also a lot of rocks forming the wall which are designed to be shrapnel so that any ground soldier will be injured, or worse. Believe it or not, North Koreans are people just like you and me and enjoy their leisure time. 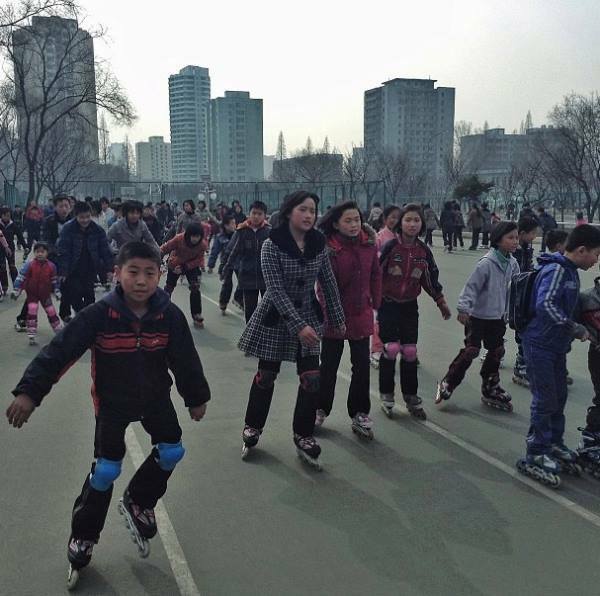 One of the main things that (wealthy) North Korean children love to do is rollerblade. Despite the fact that they may be about 20 years late to the party on this one, it is something that gives them pleasure, and a tiny sign of the country sort of catching up to the rest of the world. This girl is holding something which could get her, her family, her future children and her future grandchildren sent to a concentration camp. Weapons of any sort are strictly forbidden in North Korea for fear of an uprising or a coup. 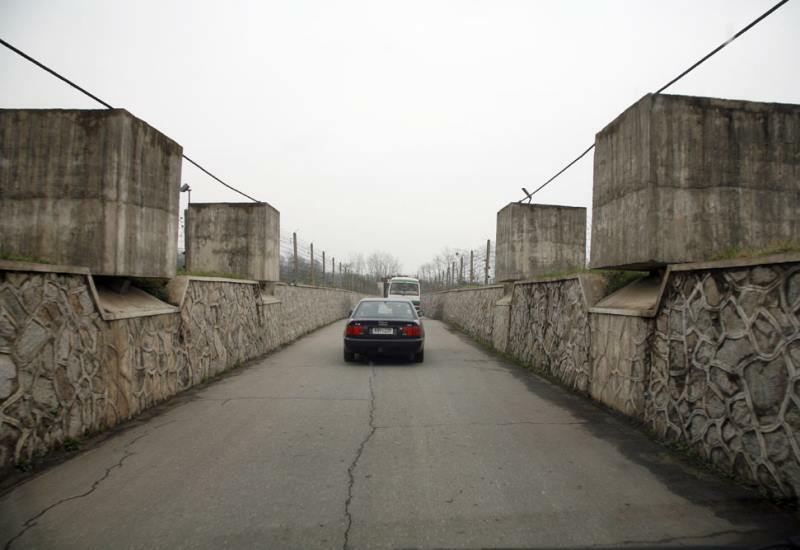 Anyone carrying a weapon will get sent to a camp and have three generations of their family imprisoned. It makes us wonder, are there more like her out there waiting on the world to save them? This woman has set up an illegal business in her small village, selling a few essentials to make a little bit more money to try and improve her and her childrens’ situations. However, most of the authorities in the area probably do not care too much, as she is probably selling smuggled goods from China such as cigarettes and candy to them as well. As long as she sells at a good price or gives them gifts, she will be fine. 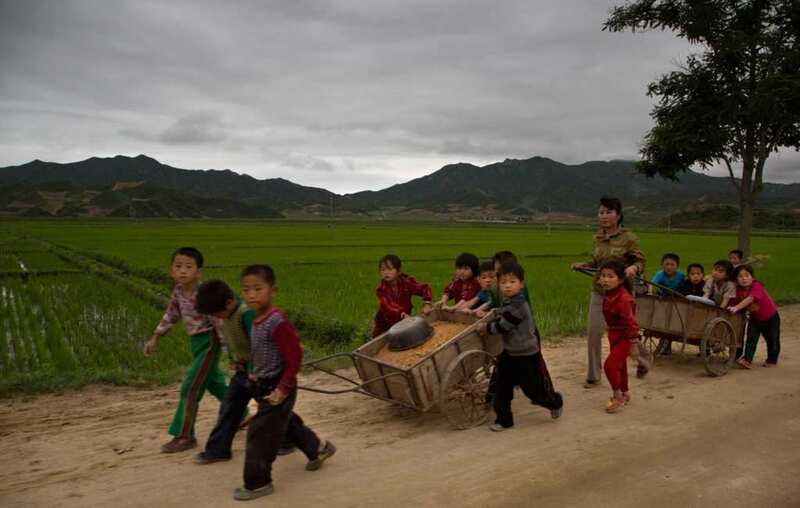 This is yet another photo showing children working the fields in North Korea. It appears that without the government taking these kids out of school to work, there would be even less food in the country than there already is. These children, especially out in the poor countryside, probably have no idea what a real childhood is like, and think that everyone all around the world has to work this hard too. 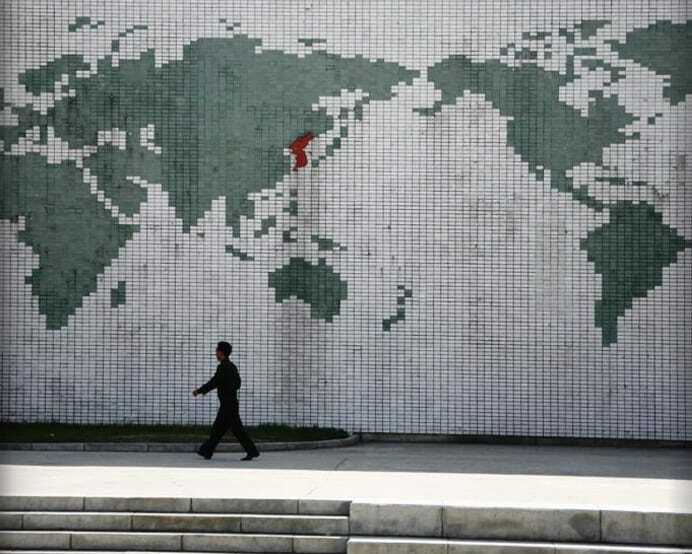 North Korea believes that the entire Korean peninsula belongs to it. That is why it has a huge military arsenal pointed at the country of South Korea, including nuclear weapons. Due to the bellicose nature of the leadership and its refusal to speak to the West, North Korea has been almost completely sealed off from the rest of the world with no friends except for China, Sudan, Syria, and Iran.